Our all time favorite rolls - thank you, Sister Miller! Scroll down for a link to the recipe. I think we are seeing daily how much this is needful. We are living in a time where so many need our help, so many are hurting. Even a warm smile will help another. Now is when we as a people start setting some goals and readjusting budgets, resolving to live more frugally and make lists of what skills we want to learn or strengthen. Sometimes we wish we had more income without realizing we can have more by being more frugal. I know the big bad b word - budget - comes into play, if we continue to pretend it doesn’t exist we will be stuck or worse. I know it is hard to make the adjustment but it isn’t really so bad just don’t shop without knowing your balance or what yet needs to be paid. One thing that drives me nuts is when people just check their balance and say I am good, I have twenty dollars in the account but without consulting the true balance, the one where a bill is about to come out of the account for $19 they eagerly run out to spend it causing bigger troubles ahead. Then there are those who don’t even bother checking the balance, if the card goes through they have it, right? I call this one sticking our head in the sand. If we don’t see it coming it can’t hurt us, right? Wrong…remember one of your ends is still exposed. It takes talking together, asking what do we need to pay and so forth. Discipline is what we need to work on. Reminds me of one time in Aldi’s a lady saw my detailed grocery list and asked did I shop for a business? I said no, why did she think so? She pointed to my well drafted list which I had each store and what I wanted at each, sale items, then what I wanted - like flour was under the store I knew would be cheapest, etc. I explained that was how I worked out my grocery list. She said she just gets stuff then gets hollered at later. I thought how awful. Head in sand for sure. I always hope she gave it some thought what I said about how I did my list. When we had more income I would gather all the sales flyers and start with those. If hamburger was on sale I made my menus around that. If something was on sale that would help my storage, I would plan something really frugal so I could do that. Pretty much that was how I did it. Now with much less to spend but having storage I am first replacing it as I use it when I can and on sales. I still start with flyers, I look at those every week. Where I shop, the stores are really not far apart so I am not loyal to any of them. They have a sale, they have my attention for that item. It would not be good on my budget to decide to get everything at that store just because of the sale of that item. I will go to whatever stores have really good sale items, even if for just that item then go to another for a different item. This is because we don’t have much to spend. Does it mean more time? Yes. Does it mean more pain? Yes, that too I must budget. Do I get every item on sale? Nope, only what we need and what we use. Staying in budget. I also don’t make a special trip, I wait for other errands and tie them all together. Am I saying you HAVE to do it my way? Nope. Do what works for you and your budget. I am sure you have more funds than I do, I have to make every dime count. Sometimes I go a whole month without shopping because I have storage that makes this possible. http://tipnut.com/shaping-rolls/ knowing different ways to shape rolls = skill building. P.S. I love the one around the clothespin. https://www.bing.com/videos/search?q=different+ways+to+shape+rolls&view=detail&mid=83171507792D083110E583171507792D083110E5&FORM=VIRE - two comments here, you do not need a scale just if it says twelve just try to make twelve. Close counts and they can be different. It is okay, in fact, make them all different... a variety bread basket. Secondly, on that last shape take your rope, dip in melted butter and then in cinnamon and sugar, you mixed together then do the knot…you will thank me later! https://www.thekitchn.com/a-visual-guide-how-to-shape-di-132961 - this one I wanted to have you see how she forms the roll. I call it bird in a cage, gives you excellent shape. 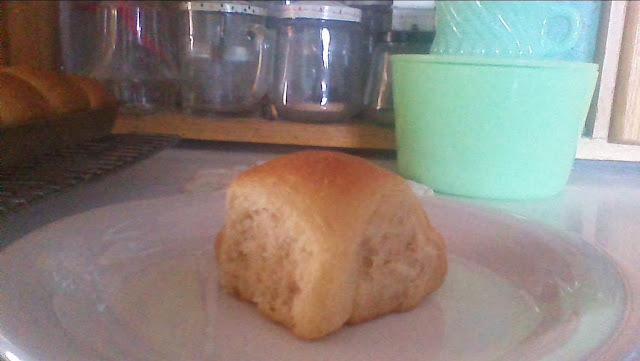 I like to put my rolls closer together though so each roll helps its neighbor to rise higher. She put them farther apart, you get a more flatter roll. And while I spent time showing you these - DO NOT leave out the ever wonderful cinnamon roll. Sure, you can buy rolls. You can even buy brown and serve but they don’t smell or taste like homemade. http://www.breadworld.com/Recipe/Brown-and-Serve-Rolls/ - did you know you could make your own brown and serve? Yep, you can! So when you make your rolls do half for supper and half you do brown and serve for a busier day. 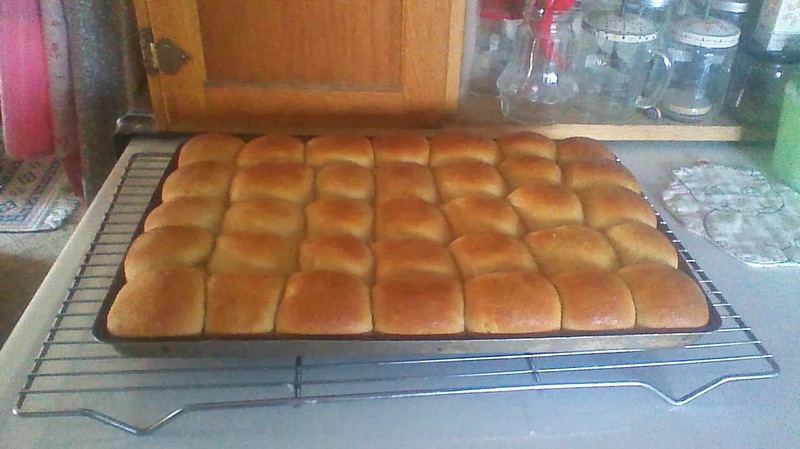 https://recipes.howstuffworks.com/make-your-own-brown-and-serve-rolls-recipe.htm - here is another to try. 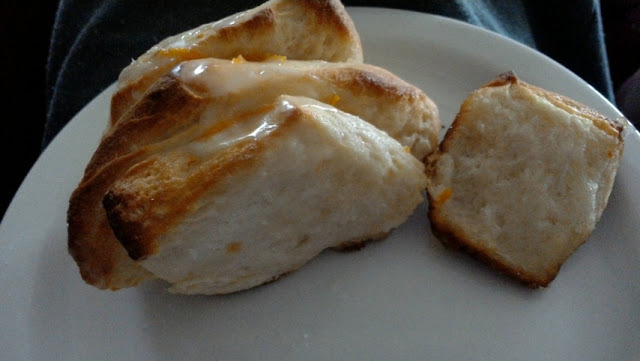 http://frugalmeasures.blogspot.com/2014/01/sister-millers-rolls.html - my all time favorite! Sister Miller shared this with us and we thank her, not only are they the best ever they make up into kits kept in your refrigerator. http://frugalmeasures.blogspot.com/2016/04/monday-message_11.html - and don’t forget the orange rolls. Making rolls are frugal and best made at home. Keep working on your skills, your storage, and ways to be frugal. Glad to see your blog again, Happy New Year. I really enjoy your writing, thank you for the time and effort you spend! I learn from your writing and also just enjoy reading about frugality to get new ideas or just remind me of the benefits. we thought we would give you all time off to spend time with your families. happy new year to you as well. Happy New Year! As always, a good read. Happy New Year! I grocery shop like you. We have three grocery stores fairly close by, and I make my lists based on what's on sale. While I'm there, I may pick up some extra unadvertised-yet-on-heavy-markdown items (like the day I stopped by the store and found they had strawberries on sale for 3/$1. I brought home 21 large containers and spent the next eight hours chopping, freezing, and making freezer jam). One store has a clientele that comes from all over the world, so that's where I get my Asian and Indian ingredients. But I don't make special trips- Wednesday is my day to shop, unless they're having a special sale on a certain day and then I'll switch to that day- and I always, always, always have a list. I don't understand how anyone shops by just throwing things in the cart at random!!! You shop like me. ow that it is just hub's and I I have to cut back on cooking and it is hard. yep I make every trip count I had an unused rye loaf I did not want to go bad so I made ham and cheese sandwiches froze them now I grab two and butter each side and fix like grilled cheese however they can just be uncooked as well. I shop like that too. Oh goodness! 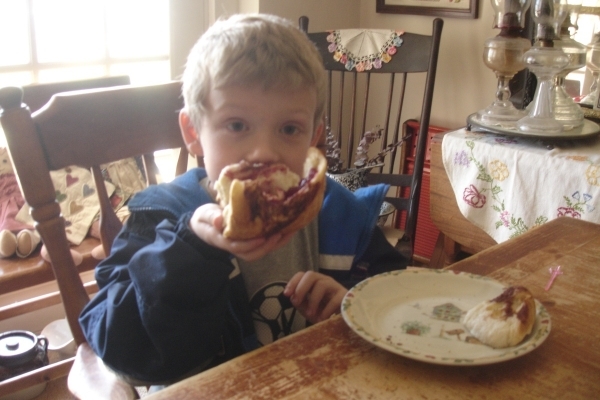 Those yummy cinnamon rolls!! I tend to plan our menus around weekly sales too. I'm amazed at people who don't!! I love making homemade bread, rolls and bread sticks. They taste so much better then store bought.